Working for a big box gym and having always been a regular gym user myself, I had achieved weight-loss and gained some muscle. I had always wanted to take my health and fitness to the next level and my dream was to gain a more shredded physique. Having previously tried other personal trainers, I wanted to find someone who was truly invested in getting the best out of their clients. So I began looking for a gym that had a truly remarkable track record, a gym that understood the results I wanted and had the ability to give me the diagnostics and nutritional expertise to achieve them. This was when I came across Mark Ottobre’s Enterprise Fitness. In my short life I have never met anyone who I could say changed my life until I invested in Enterprise Fitness. The passion and dedication here helped me turn my dream into a reality. I was constantly blown away by the knowledge on nutrition, experience and technique tweaks here. 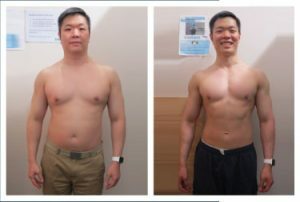 My trainer helped me perfect my training technique so that on the days which we didn’t train together, I was still able to achieve maximum results by following the program combined with the nutrition. I owe my body transformation to him. Without his guidance and support I never would have achieved these results and made such massive gains. I truly can never thank Enterprise enough! They are the ultimate personal trainers and friend. Investing in Enterprise Fitness has been the best thing I have ever done. I not only gained the body I always wanted but I gained the knowledge and specialized training to help me sustain these life-long results.